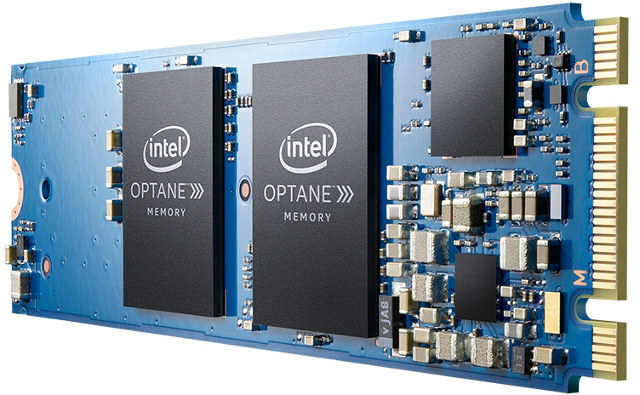 Intel launched their first Optane SSD based on 3D Xpoint technology for the enterprise/datacenter market last week, and now the company has announced 16GB and 32GB consumer grade Optane memory will start selling in April starting at $44. The cards will follow M.2 card (80mm) form factor, use a dual PCIe NVMe 3.0 interface, and currently only works with Optane compatible motherboards with 7th generation Intel Core processors. Intel promises boot times that are twice as fast, 28% better overall performance, and 65% faster game level loads thanks to vastly improved random I/O performance. We can see some of the specs for both cards on Intel website. I reproduced some of the performance reliability data in the table below. The read sequential performance looks good, but the write performance is lower than one some of cheap mini PCs I’ve reviewed in the last year. For example the 128GB FORESEE SSD inside Voyo V3 mini PC gets respectively 400 MB/s and 200 MB/s sequential read and write speed in actual benchmarks. What make Optane memories stands out are random read and write performance, as well as ultra-low latency, which explains why Intel promotes system boot time and app loading times. For example, Microsoft Outlook will launch up to nearly 6x faster, and the Chrome browser up to 5x faster. I’m not too familiar with endurance data, and it’s really odd MTBF is expressed without unit, but if we look at an Intel 30GB consumer mSATA SSD for comparison, MTBF is expressed in hours (1.2 millions), so I guess that means the Optane memory MTBF is 1.6 millions hours, and the UBER number is less than 1 sector per 10^16 bits read, so endurance numbers are mixed, and there does not seem to be any clear advantage for the Optane memory in that respect. Power consumption of Optane memory is also much higher than the mSATA SSD I linked to (Idle: 250 mW; active: 300mW). Intel Optane memory will start selling on April 24th for $44 for the 16GB version, and $77 for the 32GB version. 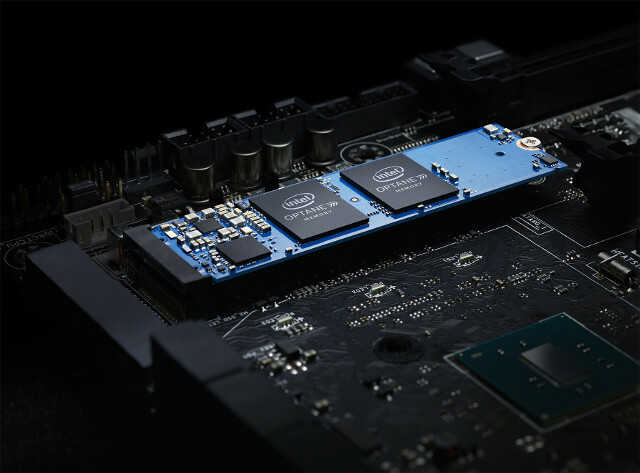 You’ll be able to install the memory in one of the 130+ Intel Optane memory ready motherboards from manufacturers such as Asus, Gigabyte, MSI, ASRock and others, and in Q2 2017, several PC manufacturers will start selling computers equipped with the new 3D Xpoint memory cards. More details may be found on Optane memory product page. The MTBF is probably million hours (which is standard for SSDs). The endurance is actually rather impressive for an SSD, which it should be given that was one of the touted advantages of Optane. For reference, a 512 GB 960 Pro has an MTBF of 1.5 million hours and a Total Bytes Written of 400 TB, which means you should be able to rewrite the entire drive ~800,000 times. The 32GB Optane is 182.5TB which is less but the drive is 1/16th the size… so you can rewrite the entire 32GB 5,824,000 times or ~7.28x that of the 960 Pro. If the write throughput wasn’t so dismal this would make an awesome ZIL drive for ZFS (and it’s not bad for prosumer use, it’s still enough to handle the bandwidth of a gigabit connection on a NAS/FileServer). These are intended to be a type of cache to be used with a regular HDD. Read the Intel doc for all the details. I see something that I feel wrong in your calculations. 800000 times is not the result of writing a whole 512GB entirely to reach 400TB of data, it’s else 800 times or else 400PB. The same goes for the Intel thingie. And I should note that for the average user, write latency is going to have more of an impact on perceived performance than write throughput. Your average office/home probably doesn’t write 290MB of data on any given day, much less in a second. Your average office/home probably doesn’t write 290MB of data on any given day, much less in a second. Don’t under estimate the amount of writing that a PC running Windows does in the background while doing nothing. It can be GBs/day! The Linux kernel community seems actively researching the possibility of using NVRAM as system memory. Intel has developed the hardware interface (NVME), HP is developing a huge-memory system (hp the machine), and Kernel community is working on 5 level memory mapping, fast swap memory and others. Honestly I don’t quite understand the use case of such NVME-backed huge memory system. Right now you can get at least 16GBx4 per NUMA node easily and NVME RAM is clearly targeting several TB per CPU core. Also I don’t think low write performance is a big deal since writes can be easily buffered by the OS. Also, even the 32 GB model seems insufficient as a stand alone drive, so probably bcache/bcacheFS? Also its really strange that this product requires 7th processor? Why? Don’t know the details but these sit on the PCI bus so perhaps there’s some architectural ehancenent in latest CPU/chipset to optimize the HDD caching functionality. Yep, latency with (ultra) low queue depth looks not bad. They telling us to wait for alternative. Could someone describe where is Wow in this release? Today we already have Samsung NVMe SSD with 100$ for 128gb module. And they are faster than described Intel, bigger, cheaper and sold for one year. Roughly equivalent or even a bit better compared to the 32GB Optane. I’d guess larger Optane memories would have better IOPS numbers. 3D Xpoint is not really revolutionary based on those numbers, but as mentioned by others if you have a system with a hard drive, adding the Optane memory would be used as cache to boost performance, and it is cheaper than buying a 128GB or 256GB SSD to get similar performance. MTBF is about the same with 1.5 million hours. Could someone describe where is Wow in this release? This is not a replacement for consumer or data center storage but acts as something in between slow storage and DRAM and it’s all just about ‘high-endurance, low latency and Quality of Service (QoS)’ to be able to accelerate Windows usage and gaming. In other words: an attempt by Intel’s marketing to solve a classical chicken-egg problem adopting new technology.